Every comet, asteroid, and planetoid astronomers have been able to examine up close is native to our solar system, but scientists have long theorized an interstellar visitor could one day come rocketing through our neighborhood. That’s exactly what happened earlier this year when researchers at the Pan-STARRS observatory detected ‘Oumuamua, the first asteroid from interstellar space ever discovered. It’s moving so fast that we’ll never be able to catch up to it, but a radio astronomy project backed by Russian billionaire Yuri Milner has announced a plan to take a closer look at the object to see if it’s emitting any signals. ‘Oumuamua is an unusual object in several ways, which made it difficult to identify when it was discovered a few months ago. Astronomers first thought it was a comet based on what we know about solar system formation, but further observations showed it lacked the gas and dust envelope of a comet. Thus, astronomers determined ‘Oumuamua was actually an elongated asteroid between 30 and 180 meters in length. The International Astronomical Union eventually created a new naming scheme with an I-designation for interstellar objects, so ‘Oumuamua’s official name is 1I/2017 U1 (‘Oumuamua). What if it’s not an asteroid, though? What if it’s an alien spaceship? It’s probably not, but we should be sure, right? We know that ‘Oumuamua is from another solar system because it has an orbital eccentricity of 1.20, meaning it’s well past the sun’s escape velocity. Nothing that originated in our solar system could have reached such a high speed, so ‘Oumuamua comes from someplace else. It’s currently on its way out of the solar system at 38.3 kilometers per second (23.8 miles per second). We can’t catch up to it, but the Breakthrough Listen project can still take a closer look. 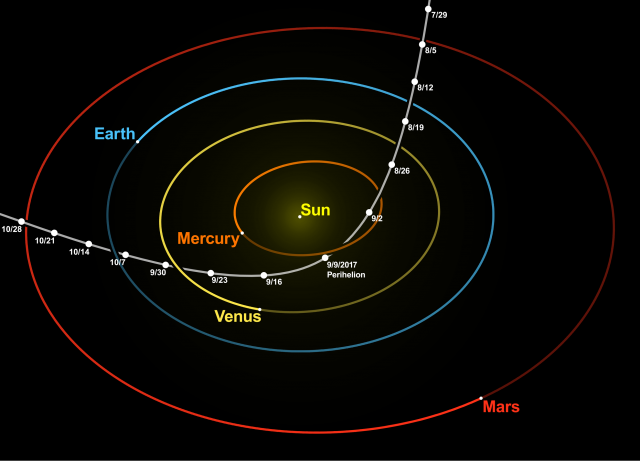 ‘Oumuamua’s path through the solar system. Milner says Breakthrough Listen will begin using the Green Bank Telescope to scan ‘Oumuamua this week. The telescope will observe the asteroid for 10 hours across four radio bands. If it’s emitting any radio frequency energy, Breakthrough Listen should be able to pick it up. This might be our last chance to learn something about ‘Oumuamua before it’s too far away to study. Next year, it will pass the orbit of Jupiter, and by the mid-2020s, it will pass into the Kuiper Belt. Odds are that Breakthrough Listen will detect nothing from the object. After all, it’s probably been falling through interstellar space for millions of years, and that’d have to one durable alien spaceship to still be working. Still, if there’s some signal emanating from ‘Oumuamua, that’s probably something we should know about.